We’re fully immersed in the school year and work is in full swing as we gear up for the busy end-of-year … so it’s easy to fall behind on our healthy breakfast routines. But save the time (and the cash) of a run through the Starbucks drive-through with these healthy make ahead breakfast treats from this week’s Seen on Pinterest. The breakfast burrito or sandwich is one of our favorite make-ahead meals. Start by whisking together one egg per sandwich or two eggs per burrito. Use egg whites or egg substitute if you prefer. Sandwiches are simple—layer one egg (fried, scrambled or poached) with one slice of cheese and one part meat on a bread of your choice—we like English muffins or sandwich ‘thins’. Wrap in foil or plastic wrap, and freeze. The night before, thaw in the fridge, and microwave for 60 to 90 seconds to re-heat. At that point, add tomato, hot sauce, or spinach to taste. Try these freezer burrito ideas. Or, try another tactic and get creative with quesadillas. Want to skip the bread? make the burrito or sandwich into a ‘bowl’ by putting your eggs and toppings over shaved potatoes or sweet potatoes. Don’t forget a drizzle of hot sauce, ketchup or syrup (depending on your flavor profile) for a satisfying kick. Find more bowl ideas here and here. Sure, baked goods are by nature portable, but they aren’t always healthy. Use your muffin tin for egg bakes instead and get that protein in instead. Whisk together one egg per cup, and add in your favorite veggies and meats (pre cooked). Lightly prep each muffin tin with nonstick spray, and bake for 20 to 30 minutes until eggs are firm. Freeze for the perfect on-the-go breakfast that tastes like Sunday morning on a Monday morning timeline. We love these hearty breakfast bakes. Oats are anything but boring. 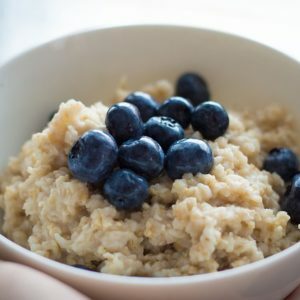 Our two favorite make-ahead varieties use steel cut oats (not instant) for a healthier, more satisfying taste. Overnight oats involve adding liquid (usually milk) to your oats and letting them “sit” in the fridge overnight. We love adding mix-ins, like chia seeds or flax, for added oomph and nutrition. Mix in anything you like – raisins, dried or fresh fruit, peanut butter, or even chocolate chips to create a flavor profile you love. Or, make oatmeal in the crockpot so that it’s fresh and warm when you wake up. We love adding sliced bananas and cinnamon to this variety for a taste that rivals the finest bananas foster. Try these baked oatmeal varieties (the one in the photo is from Coffee and Quinoa) or these overnight oat options. Yes, these are really a thing. Usually made with oats and fruit and eggs, these simple yet filling cookies are a healthy way to start the day. Just limit your portions – just like dessert cookies, these are only good if you stick to some portion control. These pumpkin cookies are perfect for fall. If you’re like us, a juice, no matter how fresh and how healthy, isn’t breakfast. But a protein-packed thick smoothie is often enough to get us through the morning. Mix together your favorite fruits and veggies with any herbs or spices in pre-portioned baggies and pop in the freezer on Sunday evening. Come morning, add your required liquid and blend. Frozen fruits act like ice cubes to create a slushy effect without watering down your smoothie, and the prep work will be all done!